Regular readers will know how I love a good burger – and pickles, I’m a sucker for pickles. 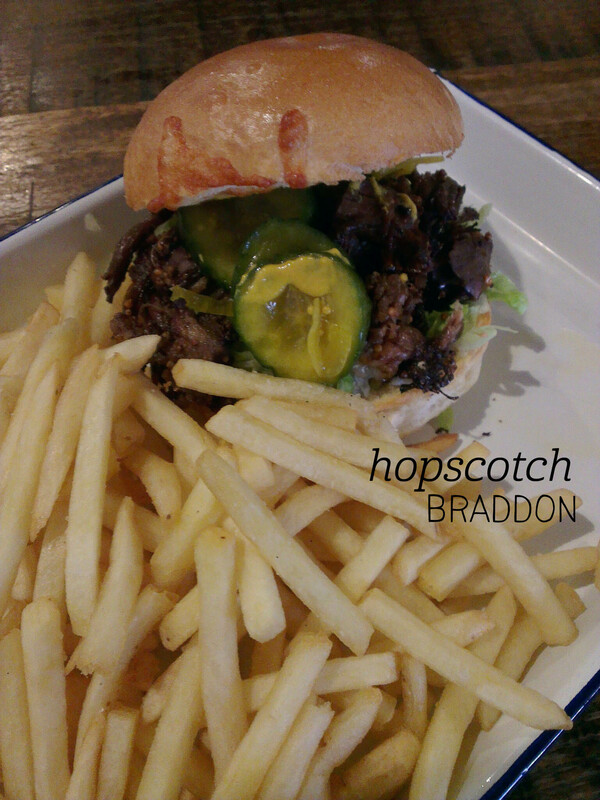 So it’s no surprise that I’m always willing to try the burger on the menu, which is exactly what I did when we holed up at Hopscotch on a particularly chilly afternoon. Which burger, I hear you ask? The specials menu offered a pulled beef burger with wholegrain mustard and pickles. Sold. The food took a surprisingly long time to come out, given how quiet the place was, but when it did the plate was packed full of chips (and there was plenty of burger too). The fries here are great – thin and generally crisp (I reckon they could have been in for a tad longer this time around) they’re also nicely seasoned – very moreish. The burger was a good size, although I found the beef to be a bit tough, like it had been cooked just a bit too far. The flavour was great, though, and there were lots of thick-sliced pickles, which definitely helped. I enjoyed dining there much more as the noise level was low, but thought the dish was a bit average for Hopscotch’s standard. Merry Christmas! Here’s some #burgerweek goodness to help the celebrations! Little Brooklyn is one of those lovely places I always mean to spend more time at but rarely end up visiting, so I was excited to go back with friends for a catch up lunch on a Saturday afternoon. We started with a jug of sangria ($25), which was reasonably sized and packed full of fruit (oranges, blueberries and strawberries plus mint). I found it a little bit weak, given the amount of ice, but it was refreshing and tasty. 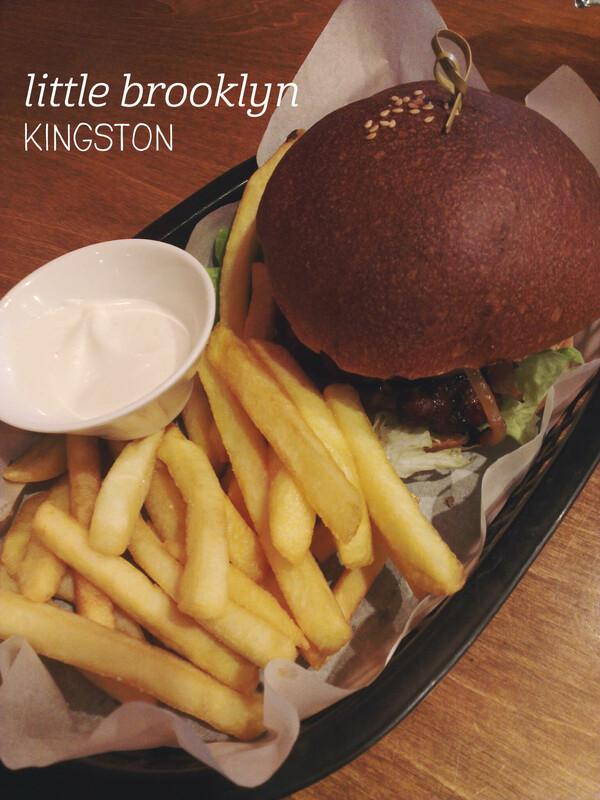 For lunch I ordered the Big Brooklyn Burger, with angus beef, bacon, cheese, pickles, caramelised onion & brooklyn ketchup. I do love a good burger, and this didn’t disappoint. The beef patty was really thick and cooked to perfection (slightly pink inside, lovely!). Adding to the flavour, there were plenty of pickle slices (one of my favourite things), loads of ketchup and even more tastiness from the bacon. I also really loved the chips, which came with a small bowl of aioli, and the meal was so filling that I couldn’t quite finish my burger. 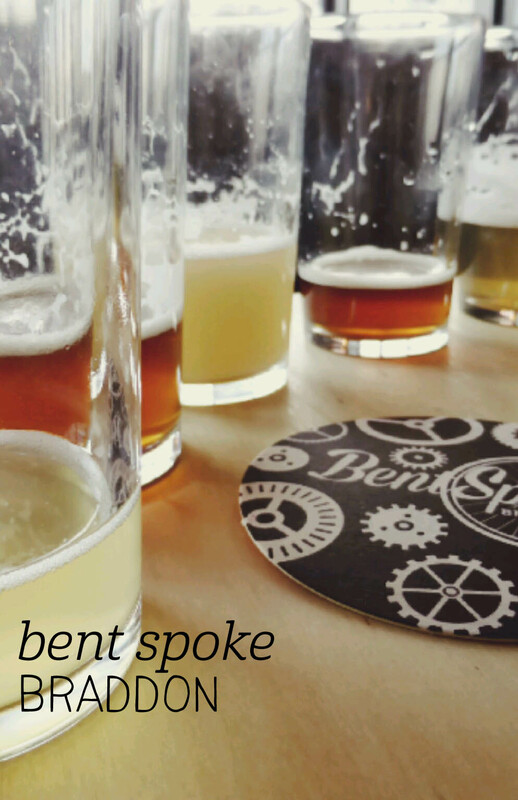 The staff were friendly and the atmosphere relaxed – keep doing your good thing guys. When your best friends offer you a free dinner, it’s pretty hard to resist. 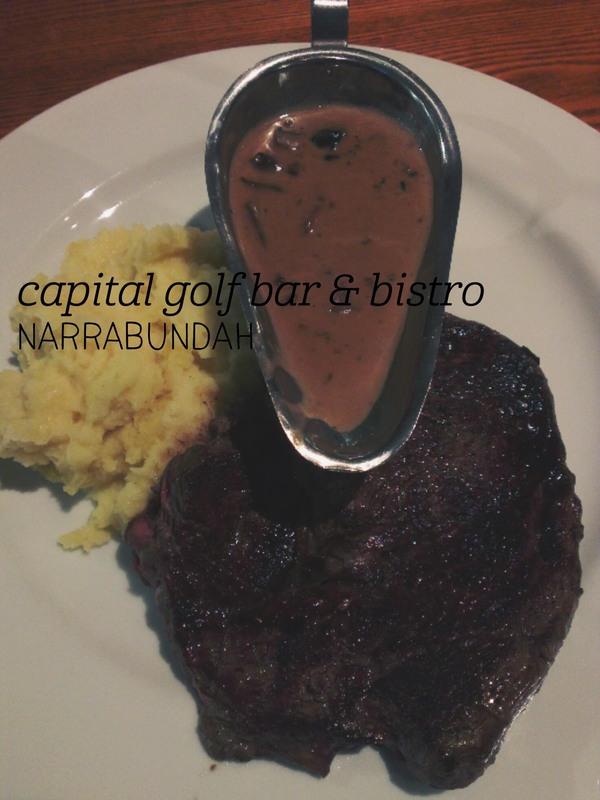 We went to the Capital Golf Bar & Bistro with a Groupon voucher for up to $100 worth of food. Hello steak! The menu had the usual pub fare of pasta, pizza, grilled meat and some kids meals, but I honed right in on that steak – 300g scotch fillet, to be precise. We actually ordered a plate of garlic bread to start, which came out lightly toasted and very buttery and garlicky (yum!). When our food came out, I was disappointed that my steak was not medium-rare as requested, but rare – just a bit too much for me. The waiter was very apologetic and a new steak was brought out fairly quickly. This was probably closer to medium, but definitely better than the other way. It came with garlic mash (small portion but tasty) and mushroom sauce (creamy with sliced mushroom inside), and the steak itself was fairly tender (not melt-in-your-mouth but not tough either) and very tasty. The meal was about what I would expect from an old-school pub (rather than a gastro-pub), with great service. On a recent visit to Canberra, I took Mum down to the Kingston foreshore for lunch. 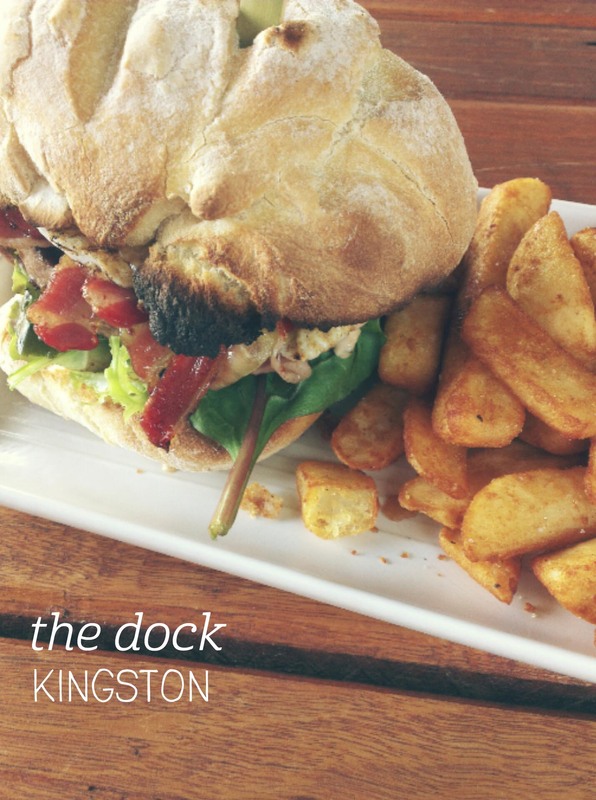 We wandered up and down, but both really felt like something a bit naughty – so we indulged in some pub grub at The Dock. Whilst the fish and chips was tempting, we both decided to go for the hot dog on the specials menu. We sat outside looking out towards the water, and after a bit of a wait (we were starting to get pretty hungry by then) our meals came out. The hot dog was a vienna sausage, topped with mustard and tomato sauce, American-style. The roll was sitting on top of a bed of The Dock’s amazing chips, with a side of tomato sauce for dipping (Mum liked the chips so much she said they didn’t need sauce – more for me!). The hot dog was really tasty – plenty of onion underneath – but we both agreed that the roll itself was a bit much considering how much filling there was. Neither of us ate all the bread, but the filling was devoured pretty quickly! We both had a lemon lime and bitters, which was huge and very refreshing. 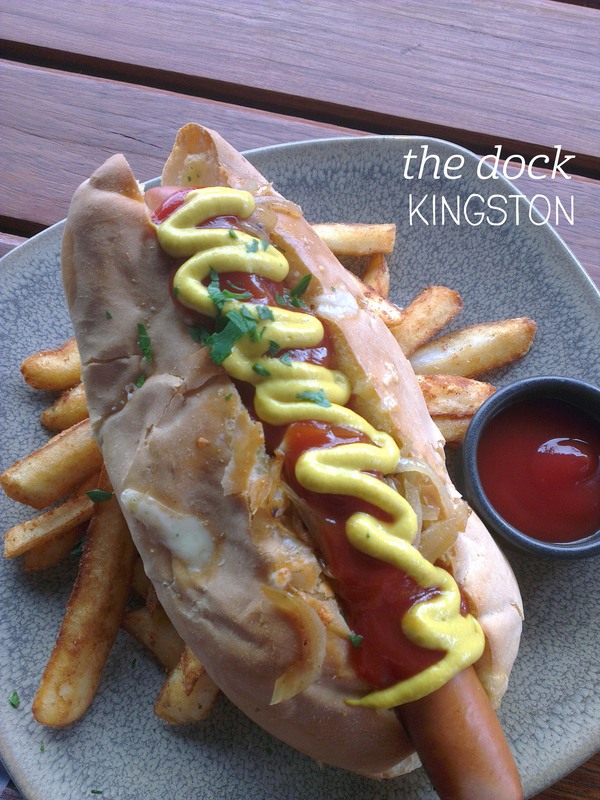 Got to love the great flavours and value at The Dock! 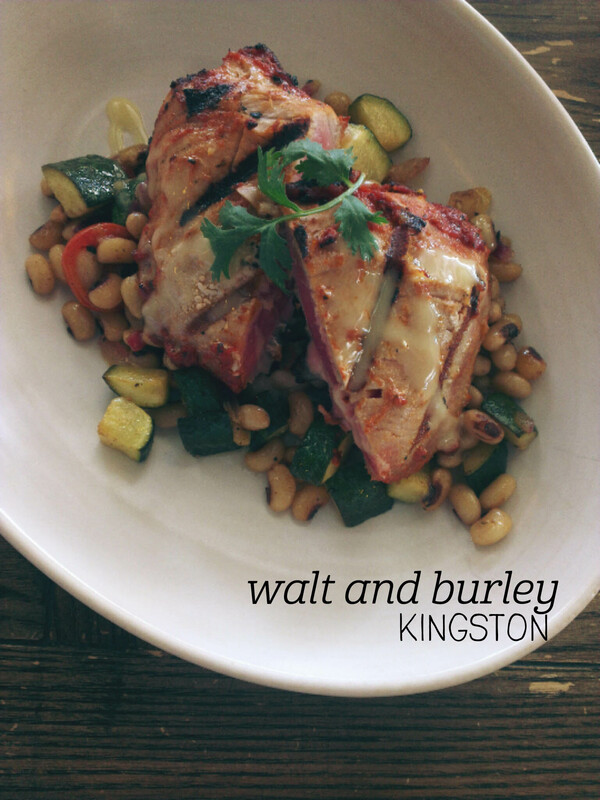 This was my second visit to Walt and Burley and I was very impressed with the whole experience. We went for a friend’s farewell lunch, and were seated at an indoor table, explained how the menu works and encouraged to order at the bar. Having had one of the burgers before, I opted for the cajun tuna loin, as part of the ‘from the grill’ part of the menu. It was a great choice – whilst a little pricier than the majority of the lunch menu, the portion of tuna is large, and when my plate came out the fish was perfectly pink inside. The outside had been seared with cajun spices, something tomatoey and cheese, and the tuna was incredibly tender. Every mouthful was a delight. The salad was perfectly matched and had a fresh spring feel about it – the black-eyed beans and zucchini combination was light and felt healthy to eat. The meal was more than enough for me, although I was a bit cheeky and picked at some of the chips we’d ordered to share – so tasty! Friends ordered the buttermilk chicken, which is the next thing on my list to try.